Fully redesigned and built using advanced CNC routing, the new aluminium crane range has been designed to complement Davco’s class-leading hydraulic swim platforms. 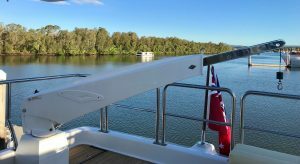 All cranes in the new range have a longer reach and feature a unique no-cover design, making them both quieter when in operation and easier to manoeuvre around on the foredeck. To ensure a rust-free foredeck, Davco’s new hydraulic cranes are the only range with a full 316 stainless steel hydraulic cylinder. And to make launching and retrieving the tender even easier, the company’s unique bevel gear drive slew mechanism delivers an unparalleled quiet, smooth and clean operation. Davco’s new range of Slimline cranes are now available through Lusty & Blundell. Product information is available from Lusty and Blundell on (09) 415-8303 or at www.lusty-blundell.co.nz.